Figure 4.7. Thoracic vertebral column, from an anterior view (a), lateral view (b and posterior view (c). 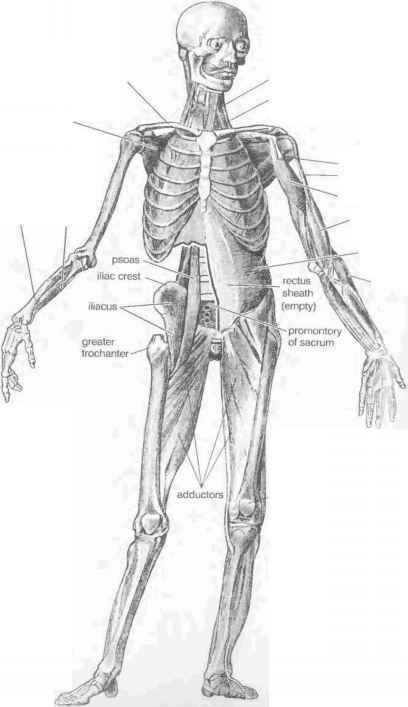 Notice in the middle thoracic region how the spinous processes point sharply downward (Sappey). palpate someone's L5 vertebral body through their abdominal wall, you can also feel the promontory (the top front border) of the sacrum. Below this promontory, the sacral kyphosis rounds so much to the rear that you can't feel its anterior surface. The coccyx (the "tail bone") is attached to the tip of the sacrum (figs. 4.4 and 4.10). 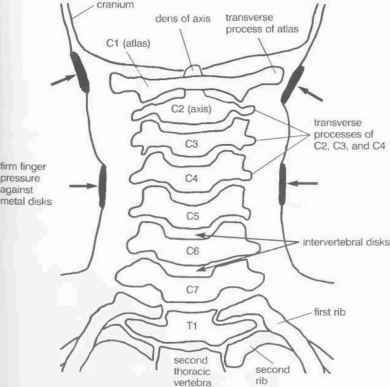 The vertebral column is composed of two distinct functional units: an anterior functional unit composed of a stack of vertebral bodies and intervertebral disks that together form a flexible rod, and behind the anterior functional unit, a tubular posterior functional unit composed of a stack of vertebral arches and associated ligaments. We'll look first at the rod. Figure 4.8. Skeletal structures of the neck in relation to finger pressure against metal disks from the side, drawn from two roentgenograms (X-rays). The images Were taken from the front. Compare with the atlas and axis in fig. 7.2. Credits to Dr. Donald O. Broughton for the roentgenograms. If we were to locate an isolated spine and saw off all the vertebral archc at the base of the pedicles, we would be left with a stack of vertebral bodiei and intervertebral disks (fig. 4.10a). Each intervertebral disk forms , symphysis between adjacent vertebral bodies that allows a small amount o compression, expansion, bending in all directions, and twisting. Th flexibility of the anterior functional unit, at least in isolation, is therefor restrained only by the integrity of the intervertebral disks and by anterii and posterior longitudinal ligaments that support the complex in front an back (figs. 4.12b and 4_i3a-b). Each intervertebral disk (fig. 4.11) has a semi-fluid core, the nucleuspulposu which is surrounded by a tough but elastic connective tissue exterior, tl annulus fibrosis. The nucleus pulposus comprises only about 15% of tl total mass, but. that 's enough liquid to allow the disk to act hydraulically every time you shift the angle of one vertebral body with respect to neighbor, the nucleus pulposus shifts accordingly, bulging out the elas annulus fibrosis on one side, and every time you twist, the nucleus pulpos presses the annulus fibrosis outward all around. The tough fibroelae connective tissue comprising the annulus fibrosis fuses each intervertebi 1 disk to the vertebral body above and below. They even run continuou from the disk into the bone. That is why an intervertebral disk ne\ "slips." It can only rupture, exuding some of the gel-like nucleus pulpo: $ through a weakened annulus fibrosis, or degenerate. articular facets of sacral articul superior articular surface of rig processes sacroiliac join foramina for spinal nerve branches median sacral crest sacral promontory f igure 4.9. Anterolateral view (on the left) and posterolateral view of the sacru 1 (on the right), the latter also showing the sacral surface of the right sacroiliac joint. The sacrum is concave anteriorly and convex posteriorly, an architectura feature which is even more apparent in fig. 4 10a (Sappey).